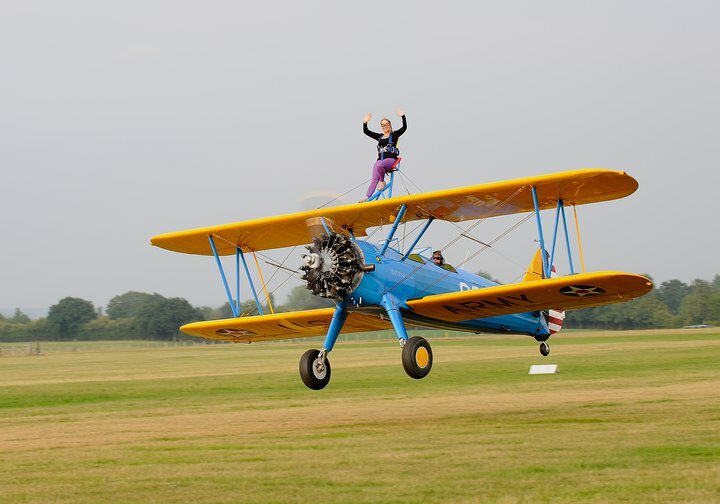 I have always wanted to fly whilst standing on the wing of a plane, ever since I first saw Crunchie ‘wing-walking’ display team at air show years ago… Seeing the girls standing up there on the planes looking like they were loving every mad-minute of it, I was green with envy! it’s been high on my ‘bucket list’ ever since. 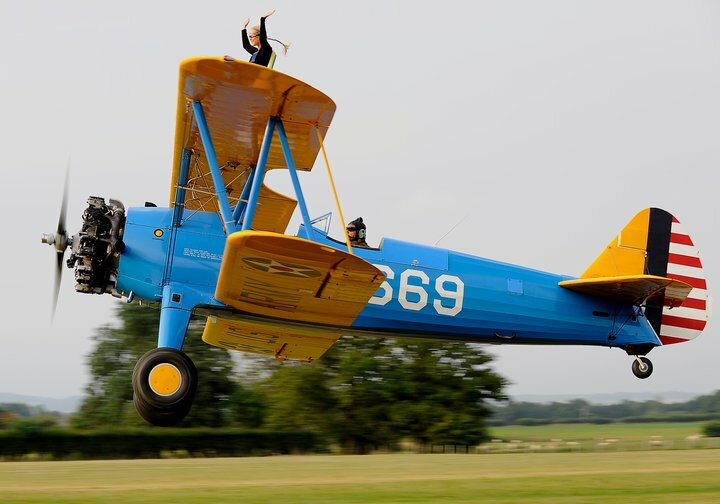 Of course, the heritage of wing-walking hails back from the barnstorming era of the 1920s when dare devils would climb out of the cockpit of their planes to fix something, or show off. 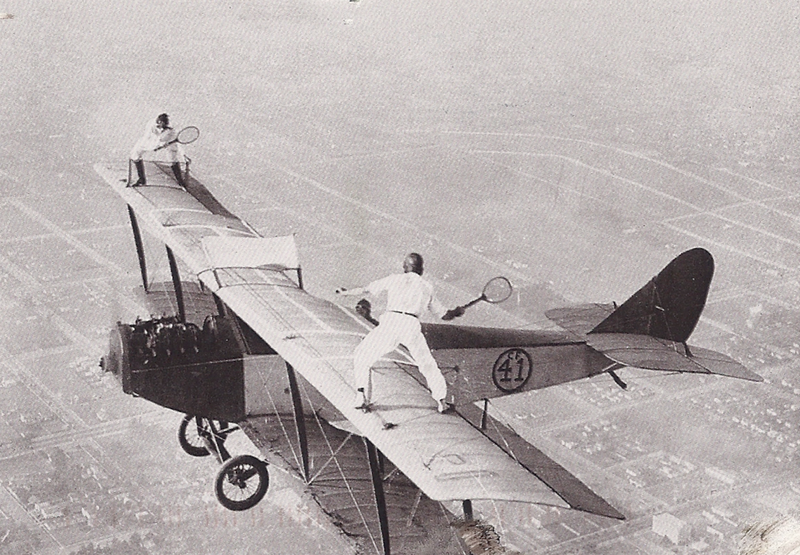 One of my favourite stock photos is this old one of a pair pretending to play tennis on the wings. I actually applied to the ‘Utterly Butterly’ team about 7 years ago (previously the Crunchie team subsequently sponsored by Guinot and now Breitling) for a chance to be a part of their display team. Alas it was not to be. I remember working with a lady a short time after that who worked for a heli-charter company that flew into air shows. 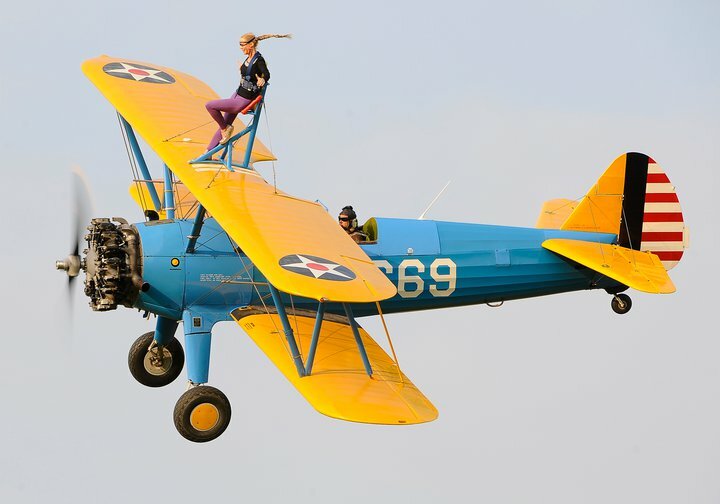 She told me that she had managed to speak to one of the Utterly-Butterly team wing-walkers. This girl explained that it was actually pretty hard work waving to the crowd, and expressed frustration if her efforts were not met with at least a semi-enthusiastic return wave from the crowd. She told my colleague that they spent quite a good amount of time working out to be physically up-to the ‘job’. I trawled the Internet at the time to see if I could buy the experience, and at the time it was not available to the general public. Less than a year later, at another air show, it was announced that one lucky member of the audience might win a wing walk. Alas, I was not the lucky one. A short time later, I learned that they were finally offering ‘regular’ people the chance to have a go, but the team are based over in Gloucester which is quite a trek for me, and at the time, the price tag was beyond my means. Finally, after losing my father this year, I decided that I would treat myself to the experience. I phoned the team, in Gloucester and there was one date that would be possible for me… Unfortunately, they phoned and had to cancel the opportunity because they had an air show that had come up. I was crestfallen. I thought probably wouldn’t get another chance to do it this year after all. My luck changed when I went to Headcorn aerodrome (near Maidstone) for my Sky Dive in May. Whilst I was there, I learned that there was a company based there called ‘Aerobatic Tactics‘ who offered, among other things, WING-WALKING EXPERIENCE FLIGHTS! My heart nearly leapt out of my chest! I called the number on the card immediately, and as chance would have it, one of the pilots was there at the aerodrome in The Tiger Club Office. Not only that, but since they dont spend most of the summer weekends flying at air shows, they had a pretty free calendar and could fit me in within weeks! I booked up immediately to do a flight at the end of July. He told me that they flew on Friday nights there at Headcorn, and on Saturday Mornings at Damyns Hall Aerodrome, Essex(near Darfort I believe) and I have subsequently found out that they also fly out of London City Airport too… I imagine it would be fun to do a wing-walk over London, but by the same token, the airspace is probably also far more tightly regulated I imagine not nearly as relaxed as Headcorn which is very much more a hobbyists aerodrome. I personally like Headcorn as not only does it have a very relaxed atmosphere at the aerodrome, but it also in the middle of the beautiful countryside where ‘The Darling Buds of May’ TV series was shot. Any way, the rest is as they say history.I arranged to return to the aerodrome on a Friday night and do it there. They offered the flights on the same type of classic bi-plane (a Boeing Stearman that the team I had seen at air shows used). I also had to sign a medical declaration, and disclaimer to say that I was aware it was a potentially hazardous activity, yadda, yadda, yadda… Same sort of stuff as I had to sign for the sky dive. I was then given a quick safety demonstration. ‘Jos’ the lady who does their display work (and also a pilot herself) then showed me how to climb up onto the wing. I have to say, she was incredibly fun, and although I didn’t experience any nerves at all, I can imagine that if I had, she would have put me very much at ease. I do remember making a comment about wishing I’d taken my havfever nasal spray, and she replied “I wouldn’t worry, with the airspeed you’ll be doing-it’s going to be a total snot fest any way!” Haha! She belted me into the harness in the top of the upper wing, fitted my goggles and explained that simple actions like waving, and turning your head is much MUCH more strenuous in flight than it is normally, and that some people find it impossible. She told me to just see how I got on, and told me that holding my arms back below me was a really comfortable flying position. She also gave me a quick word of caution to be careful with any leg movements, with the warning that if my leg came out of the ‘slipstream’ it could become dislocated which would be very painful. With that, she hopped down and Richard, the pilot who flew me told me that if any time I’d had enough, then I should point my thumbs down, and he’d get the plane back on the runway immediately. People asked me if I was nervous, but quite honestly I felt no fear at all, just pure exhilaration! Well, I say I felt no fear, I did momentarily when I thought the engine wasn’t starting. The plane is actually very old (it was built in the 1940s) and after being strapped in, I stood waiting, whilst they turned the engine over. They did this several times with a break between, and not knowing much about vintage planes, I wondered if the plane was broken (if you watch the video, you see me giggle nervously and then look back). I looked at my partner, to see if he looked concerned. He is a pilot himself, and also studied aerospace engineering. He looked undisturbed, so I relaxed, safe in the knowledge that if he was not worried I shouldn’t be either. He later explained that they do this with the engines of some classic propellor engine aeroplanes deliberately, to avoid flooding the engine with fuel, and to prime it for the flight. The experience lasted somewhere in the region of 10-15 minutes in flight time, (though the edited video is somewhat shorter). We reached speeds in the region of 120-135mph on the straight runs, which was amazing. To put that into perspective, terminal velocity (sky diving free fall speed is 120mph). We were only flying at an altitude of about 500 feet over the airfield, which meant that any friends or family watching would be able to see the whole thing without any difficulty. This is what 130moh will do do your face-no wonder I couldn’t stop smiling! Jos’s words stuck in my mind, and being the competitive little bunny that I am I waved like a maniac pretty much the whole time, refusing to be beaten by 130mph of wind. I was tempted to kick my leg out, but even moving it, I could feel my leg being pulled to the side, and the the thought of getting a dislocated him was a pretty good deterrent, one step at a time… I was quite surprised, even with the warning at how hard turning my head was, not because of tension in my neck, but because at that speed, wind has a way of working its way into your mouth, and if you turn, it creates a lot of drag! I am rather glad that they didnt take any photos of that-my face would have looked like a ship in full sail! …Even with the goggles on, my eyes watered immensely, and yes, I can confirm it WAS indeed ‘a total snot fest’; but if that is the worst thing I can say about it, it’s hardly worth noting, compared to the pure adrenaline pumping exhilaration I experienced… I couldn’t wipe the grin off my face for several hours, and when we went to get dinner at a local pub afterwards, I honestly wanted to announce to everyone in there what I had just done. I did pay the price for my waving determination, and ached for 2 days afterwards, but no more so than if I had done any other form of excersise that I was not used to. I thoroughly recommend the experience to any of you adrenaline junkies out there! I literally cannot recommend this experience enough to you! It was easily better than my sky-dive. The sky dive was over so quickly, that I barely had time to take it in, but this experience enabled me to really soak up the experience and the sights around me. Also, it was a lot more like flying, rather than falling. Any way, here is the video I made with the great footage my partner filmed. 11/10 – Yes that’s right, I said ELEVEN! This far exceeded my expectations and anticipation and was absolutely without a doubt, one of the best experiences of my life! Unlike parachute jumping, I didn’t have to wait around for hours on end. I was in and out of the aerodrome in what felt like no more than an hour. The team were really lovely and easy to chat to, and they seem to absolutely, genuinely love being a part of your experience. I wouldn’t be exaggerating to say that I was literally buzzing with enthusiasm and energy for bout 2 days afterwards! 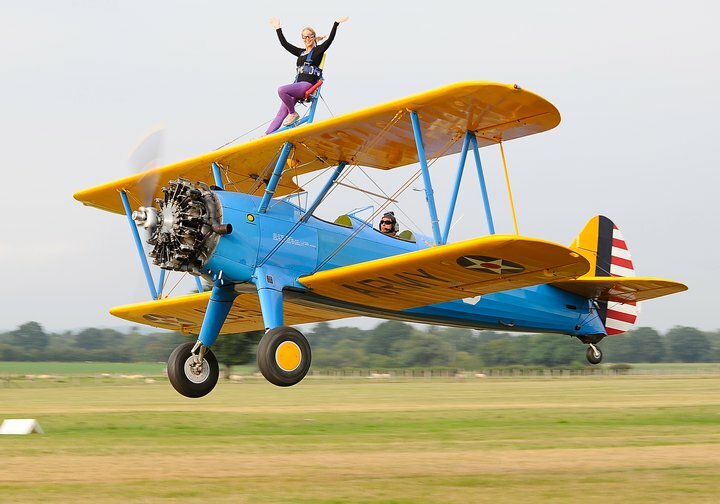 WOULD EMMA RECOMMEND A WING-WALK DIVE? Absolutely, without hesitation! I think everyone who enjoys a rush of adrenaline and has their health should try this once in their lives, and I would actually love to repeat the experience. I just went to an air show this weekend and watched the display wing-walkers with an even greater sense of envy than usual. If I could do one thing to improve the experience, I would have loved to have been able to swivel and turn upside down in the harness like the pros do, and also, to have been able to experience the plane doing aerobatics, and especially to have experienced the plane do a full roll… I’m pretty sure when I mentioned this afterwards, the team told me that their plane wasn’t fitting with an engine inverter to allow it to fly upside down (but I might have imagined that) and any way, they probably wouldn’t be allowed to do that with members of the general public. DO – Spray your nose with something to dry up secretions… I doubt it’ll make a difference, but you never know! DO – Buy the photography. It’s not expensive, and it’s a once in a lifetime opportunity! DO – Be aware that if you are 40 years old or above, you will need medical sign off. DO – have a drink of water just before you go get into the plane-to help that dry mouth. DO – Get a friend to take a video of you. At present, Aerobatic Tactics offer photography, but not video of wing walking experiences. DON’T – wear clothes that are going to flap about or catch too much wind. DON’T – attempt to do this for charity or sponsorship. It’s illegal. DON’T – rely on dutch courage-the airfield I was at will cancel your jump even if you have one alcoholic drink. Hi from a (German-) American wingwalker. By the way, I like your report and the photos. This was by far one of the best experiences of my life to date! This LOOKS AWESOME!!! Thank you Thank you Thank you! I’m adding it to my list right now! This gave me chills just watching your video. Thanks so much for the recommendation. I appreciate it. Adding this to my list at Shanepatrickjones.com/bucket-list/ IMMEDIATELY! this is AWESOME! did you do it in the states? No, I did it in the UK, but if you read the comments above you’ll see its available in the States. This sounds awesome and you can really hear the excitement in your voice. Even better is that you didn’t give up on your dream; you kept on getting up and trying again and again until you got to do it. It is one of the experiences on my list that I most desperately wanted to do… I still want to do it whilst the plane is inverted and doing aerobatics! Though the recent crash does make that seem more daunting!